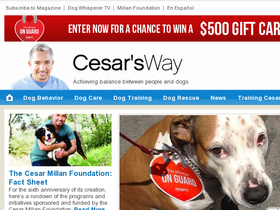 Cesar's Way, online at CesarsWay.com, is an online resource for helping people better communicate with their dogs. At Cesar's Way, you can find people training DVDs, read dog care tips, get advice about how to better understand dog behavior, and receive puppy training tips. You can also sign up for Cesar's free newsletter, order Mastering Leadership DVDs, and read about past and current episodes of Cesar's National Geographic television show. At Cesar's Way, you can also sign up for Cesar's coaching sessions. RetailSteal.com has the best Cesar's Way coupon codes, Cesar's Way discounts, Cesar's Way coupons, and Cesar's Way promo codes. Shipping and handling rates at Cesar's Way depend on the pricing of your purchase and your shipping destination. See website for full details. Some exclusions may apply. Use this coupon code online at Cesar's Way for a 10% discount off your entire order. Stop by Cesarsway.com and save $10 off your purchase of $75 or more with Coupon Code. Click link to shop the clearance section at Cesar's Way and enjoy up to 65% off apparel, books, and more. Get the Complete 6-Disc Set and save $30 at Cesar's Way. Click link to purchase now. Enjoy dog treat at cesarsway.com from $4.50 to $9.99. Click here to shop. Visit cesarsway.com and get free tips including health care, grooming, travel, safety and more. Check out CesarsWay.com and enjoy a wide range of free tips to help you train your dog. Shop at PetSmart and enjoy $3 savings on orders $10+. Click here for code. Use this code at Karen Pryor Clicker Training and save $5 on orders of $25 or more today.